Searching for scallops is so much fun it has made Citrus County a world famous destination for this unique and satisfying activity. 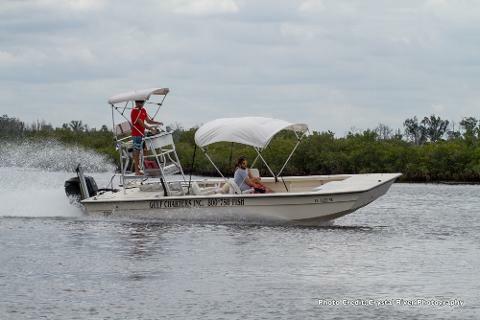 Our Master Captain will lead your group to the Gulf of Mexico for 4.5 hours of salt water delight! Take a leisurely day out of your hectic vacation and relax with confidence on our comfortable boats. Feel the wind in your hair, smell the salt in the air and bask in the sunshine while we take care of the details! 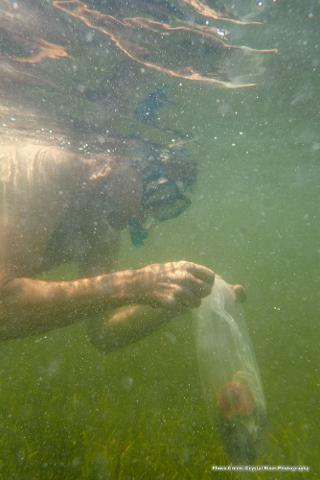 Nestled in the shallow grass beds off the Homosassa River, scallops spawn in summer and then reach the end of their life cycle. These delicious morsels are just waiting to be someone's dinner! Like an Easter Egg hunt under water, you never know what wildlife you may see out there... dolphins, sea turtles, starfish and seahorses. Corals, remora, pufferfish and conch... what will you discover on this adventure? Our Captains and guides are highly qualified and experienced; you are in good hands and will have a phenomenal time! Are you serious about having a great time and catching as many of these beautiful mollusks as possible? Then this is the tour for you! This private cruise accommodates up to 6 of your chosen guests and you all get our full attention while you hunt to your heart’s content! Explore the Gulf in confidence with your very own Master Captain and add an in-water guide to give you an advantage over the other vessels in the area. Take your time at the scallop grounds, or head inland to enjoy a dip at the freshwater springs, with this private excursion you control the time you devote to each experience. Sit back, relax and lean on us to find the richest scallop grounds available. We take care of all the details so you can truly enjoy the day from start to finish! From our waterfront location in Homosassa we are closer to the scallop grounds then in years past and this maximizes your time in the water. This year our Captains legally may not leave their boat unattended, so an in-water guide IS NOT included in this price. Everything needed is included. License, mask & snorkel, fins and scallop bag all provided! Maximum harvest of 10 gallons per vessel or 2 gallons per person. This group size is perfect for beginners who need personal attention, or experienced scallopers who wish to maximize their harvest. Please call for booking if within 24 hours. ATTENTION: This Gulf adventure is recommended for STRONG SWIMMERS, the condition in the ocean can vary greatly and change quickly. The Gulf can get choppy and you may be scalloping in water anywhere from 4 feet to 10 feet in depth (depending on tides and local of scallops). Bring small children at your own risk. Small children can be accommodated, but you are ultimately responsible for your child while out scalloping. Infants (under the age of 3) will not be allowed on a group or semi-private tour. 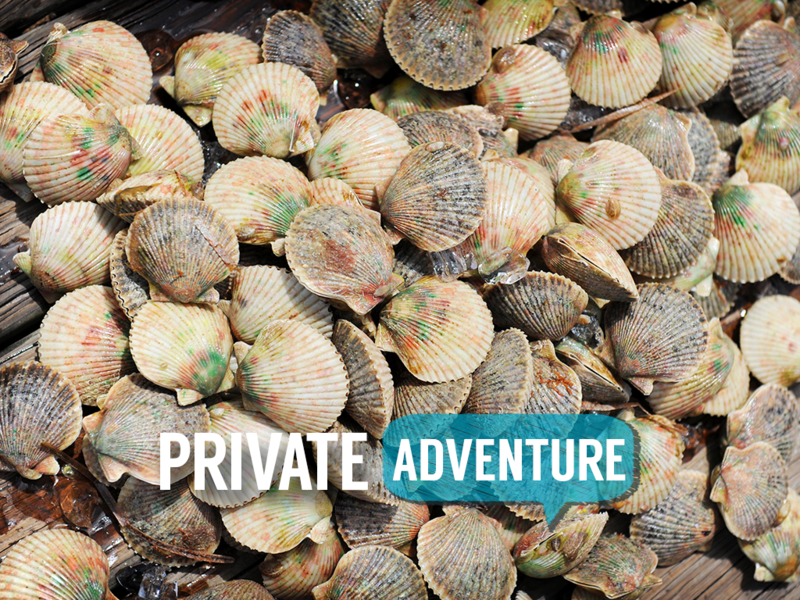 To bring a baby, one must upgrade to a private scallop adventure. 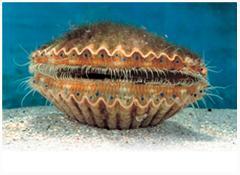 SCALLOP TOURS ARE DONE IN THE GULF OF MEXICO WHERE CONDITIONS ARE VARIABLE. THE BEST SCALLOPING CONDITIONS ARE ON SUNNY DAYS AT LOW TIDES…BEST CHANCES AT AVOIDING AFTERNOON STORMS WILL BE ON THE EARLY MORNING DEPARTURES. RAINFALL, WINDS, TIDES, MOON CYCLES AND SUNLIGHT ALL HAVE SIGNIFIGANT EFFECTS ON VISIBILITY AND ROUGH WATERS CAN BE VERY DIFFICULT FOR SOME TO ENDURE. KEEP IN MIND WHILE BOOKING YOUR SCALLOP TOURS THAT WE CAN NOT CONTROL MOTHER NATURE, PLEASE PLAN ACCORDINGLY. not bring glass containers and dispose of your trash properly. scallop is not recommended. WE DO NOT ALLOW INFANTS ON OUR SCALLOP BOATS. Ideal conditions would be clear shallow water, but during higher tides water can be 10 to 12 foot deep.This can be much more difficult to manage. NO ONE REACHES LIMIT EVERY SINGLE DAY AND IF YOU WANT THE CHEAPEST, MOST PRACTICAL WAY TO ACQUIRE SCALLOPS, THEN THE SEAFOOD SECTION AT THE LOCAL GROCERY STORE MAY BE THE BEST OPTION FOR YOU. IF YOU WANT GOOD TIMES AND ADVENTURE, THEN COME SEE US! Your Captain will demonstrate how to clean the scallops and also have suggestions of where you can go to find someone who will clean them for you. Most people choose to do it themselves, it is truly part of the experience! Your car will be waiting for you when you return, so your group is free to go about your day at your own pace.